I’m a little behind in posting, my first make of the year was actually done in January. 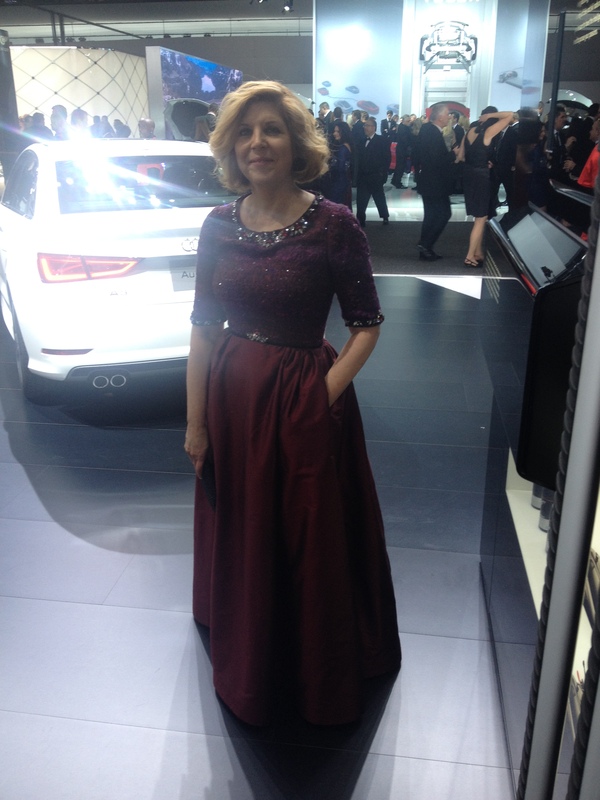 The North American Auto Show Charity Preview, also known as the Detroit Prom, was January 16. While still somewhat vision challenged after surgery to repair a detached retina, sewing still seemed a better option than dress shopping. Pinterest is a source of inspiration and the embellished looks from Chanel had me spinning with ideas. It was January 2nd before I could safely drive to Haberman Fabrics, considering it had been at least 2 months without a fabric purchase, I may have been experiencing withdrawal symptoms. It was so much fun to be back in a fabric store, so many pretty colors and textures. 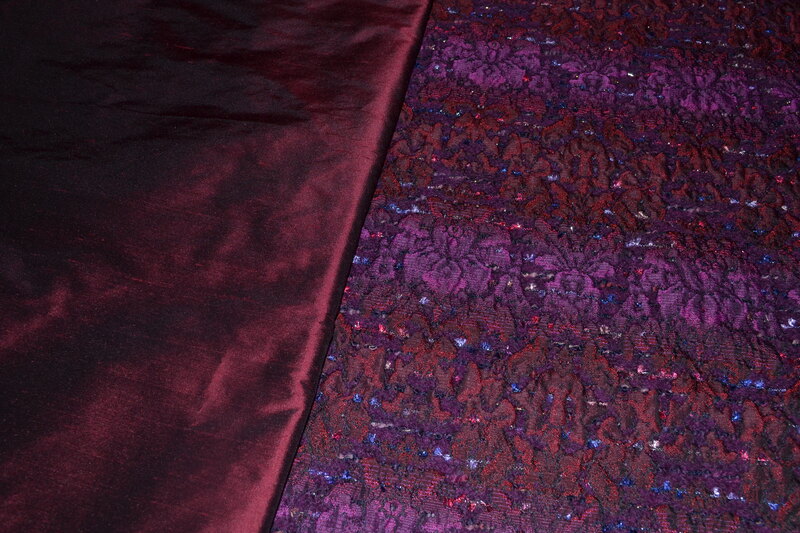 I had been thinking of silver or bronze metallics, until I saw a beautiful Italian wool and silk blend brocade. The gradations of color show more in the photos, it is much more subtle in person. The brocade would become the bodice and a coordination silk shantung would be the skirt. So two weeks before the event I have the fabric. The time crunch had me thinking, do what is familiar, now is not the time for something new. 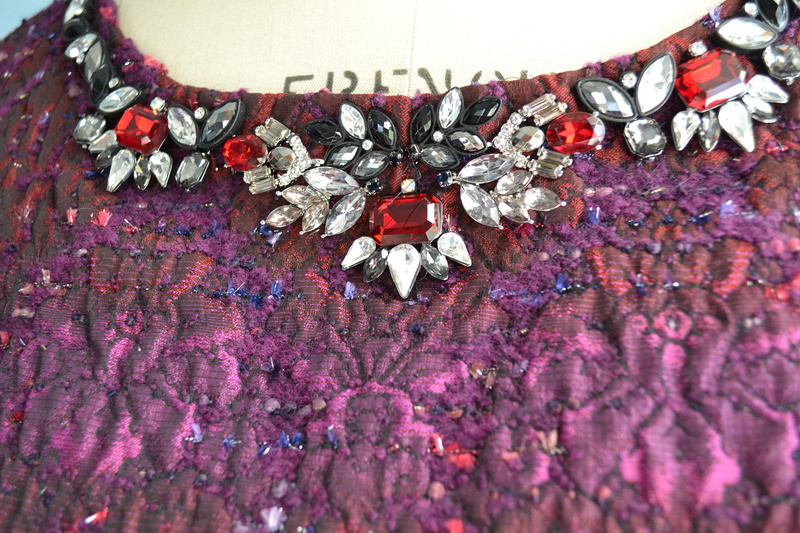 Back to my old standard for a bodice with Vogue 8849 and 8766 combined, for the fifth time. 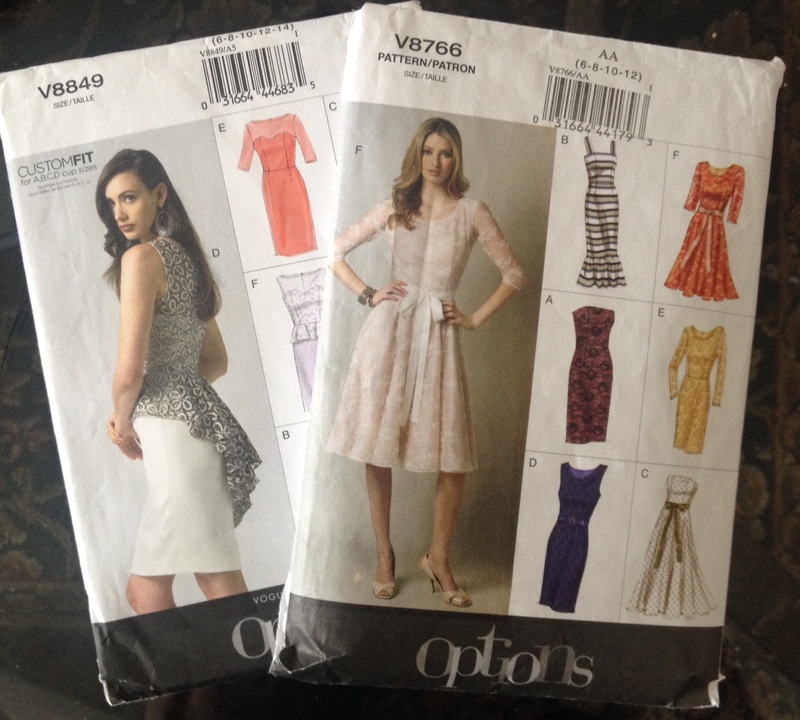 Deciding on the skirt took some thinking and going through the pattern stash. Vogue 8998, view D has a wonderful swishy skirt, with horsehair braid to give some extra body, I just needed to make it floor length. Another trip back to Habermans, for more silk shantung, was required to accommodate all that fabric greedy swishyness. Sewing with my nose inches from the needle was needed because my glasses and contact lenses didn’t really work with my slightly distorted vision. The seams may be a little crooked, but no one would see it. Making clothes with the inside as beautiful as the outside is a lovely secret, but wonky insides is a secret too. 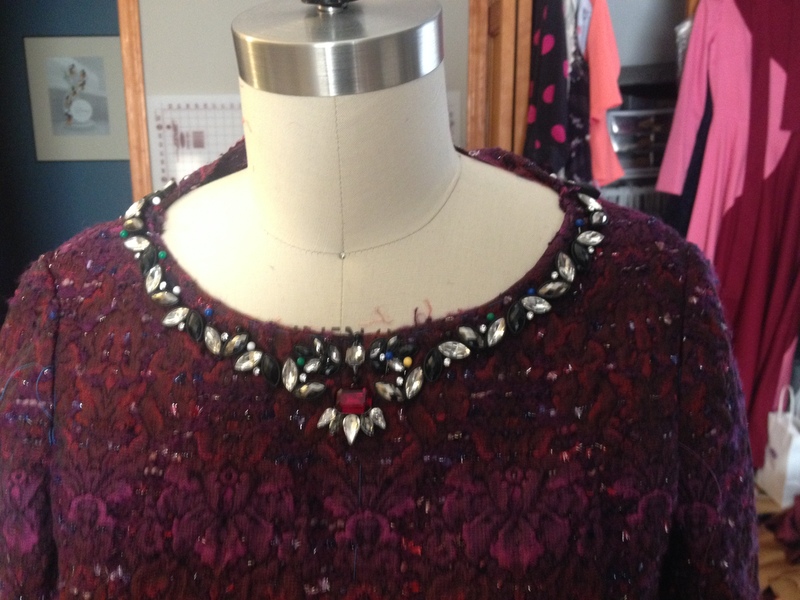 Now what to do for the embellishment? Fabric trims? Nothing matched up well. Craft store jewelry making supplies? The post-holiday inventory was sadly depleted. 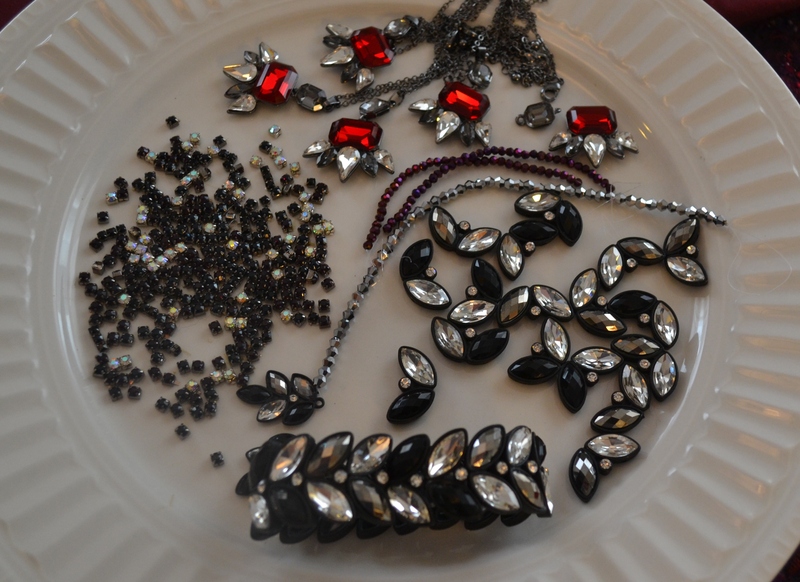 What about finding some costume jewelry to take apart? Bingo! Hello Charming Charlie. So nice of them to have all their jewelry displayed by color, they made it so easy. I bought necklaces, bracelets and earrings, ordering extra of the same from their web site. 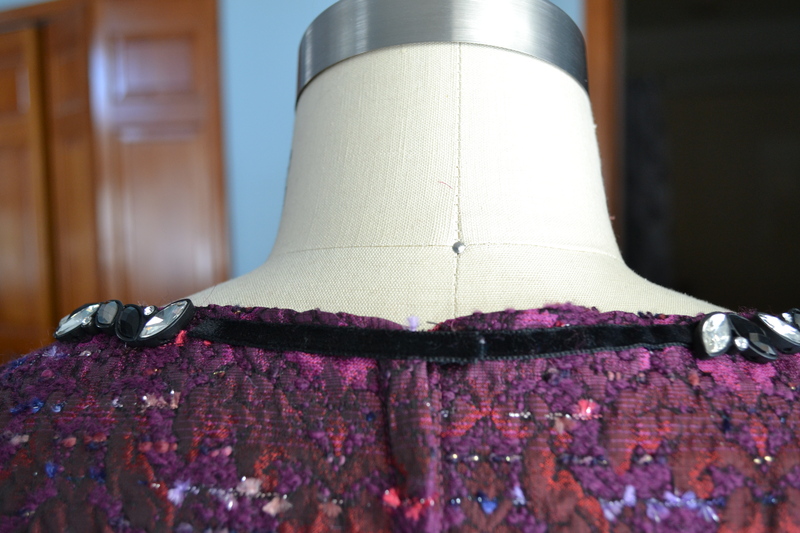 I just had to make sure each item had holes that a needle could pass through to stitch it onto the dress. It just took a little playing to get a design. Oh, and a second trip to Charming Charlie, for a few more earrings, after deciding to add some embellishment at the waist. 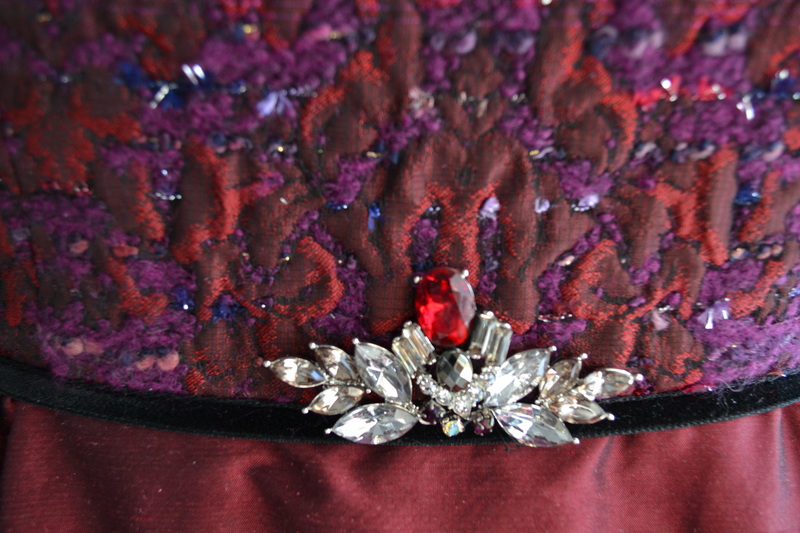 Hand stitching the jewelry pieces on with the dress on the dress form was the easiest way to work. A slow, but enjoyable process. 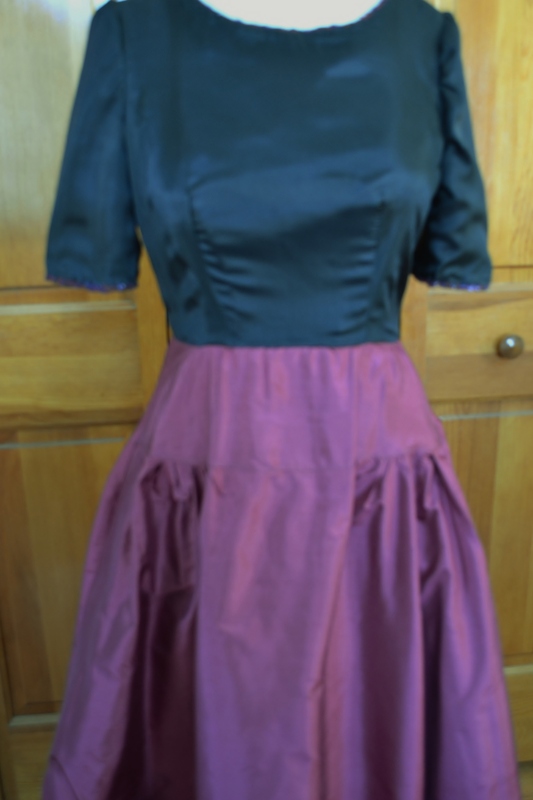 The bodice is underlined with silk organza and I attached the black silk habotia lining by hand after the embellishment was finished. 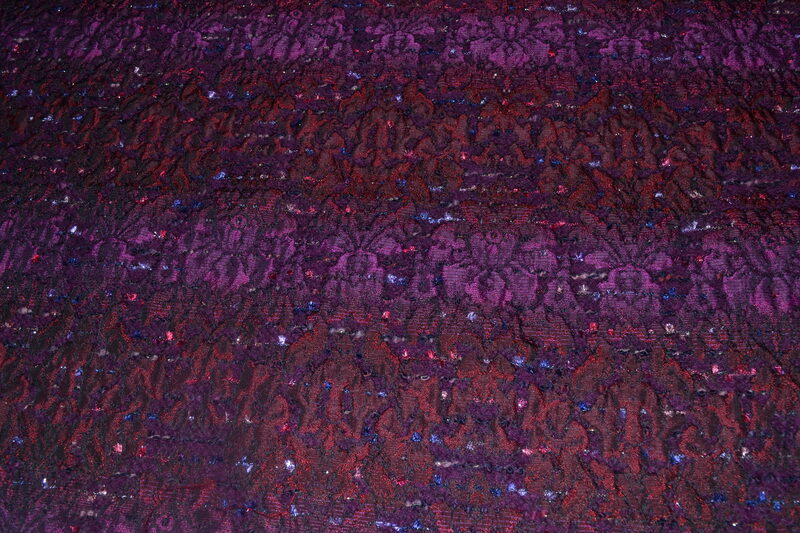 The skirt is lined with some silk dupioni I had in my stash. 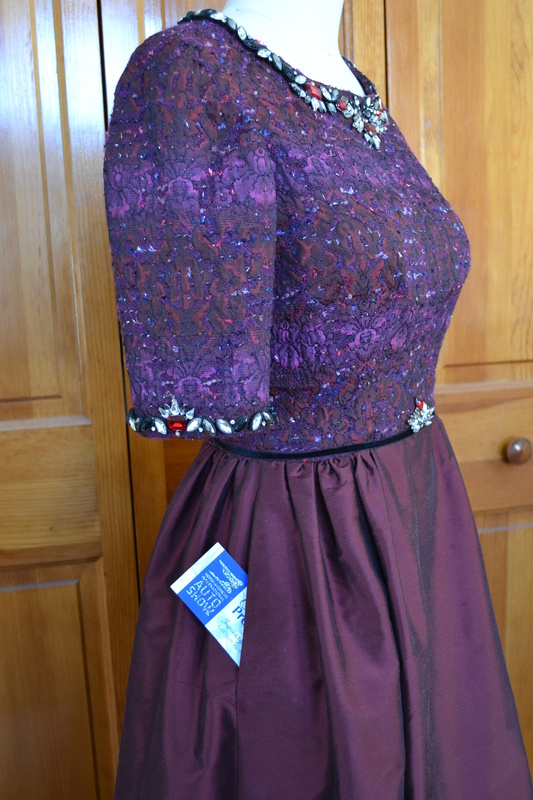 Since I did not want bulk at the waist, I created a yoke with the rest of the skirt lining based on the skirt pattern. While making this dress I found a great blog posting from Sew Mama Sew showing how to do pockets with french seams and I love having pockets in a dress. 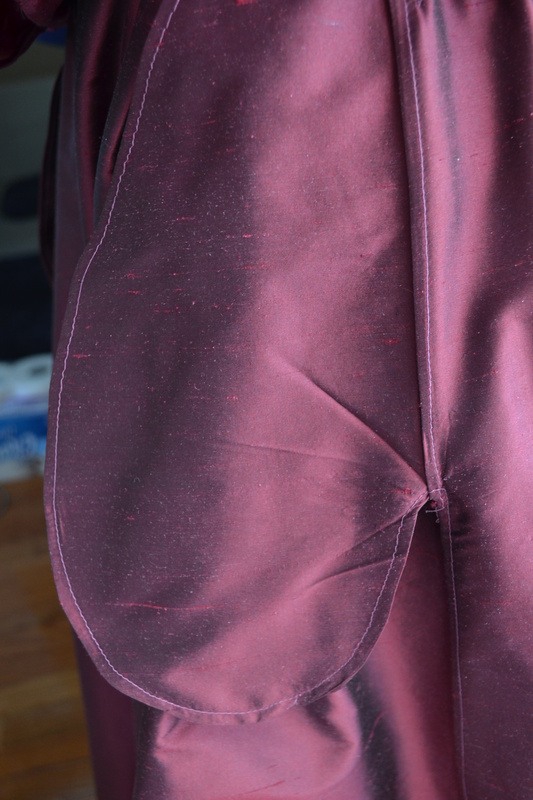 Take that you silk shantung, no unsightly fraying seams for you. Good thing I practice it on muslin, I did it backwards the first time. 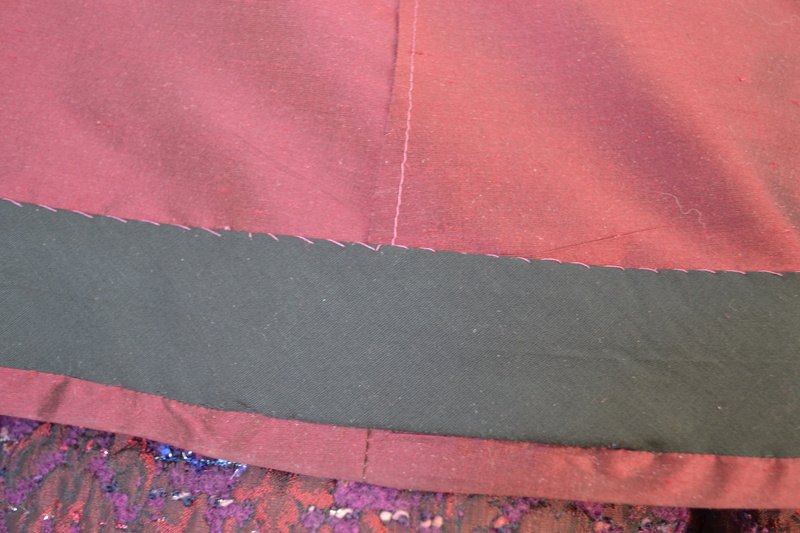 I cheated a little in covering the horsehair braid at the hem, using plain old bias tape to cover it. All that silk and then some cheapo bias tape, but the double fold wide stuff ironed open is the perfect width to cover the horsehair. And again another secret, no one saw the inside, well, except you. 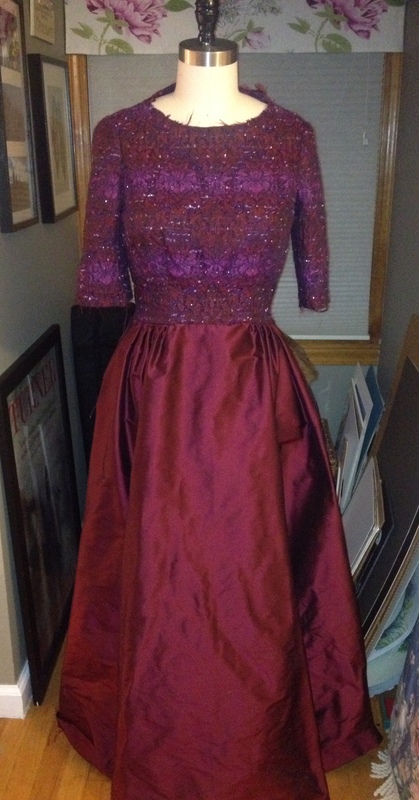 The finished dress was embellished a little less than I originally planned, but I stopped when it looked right. 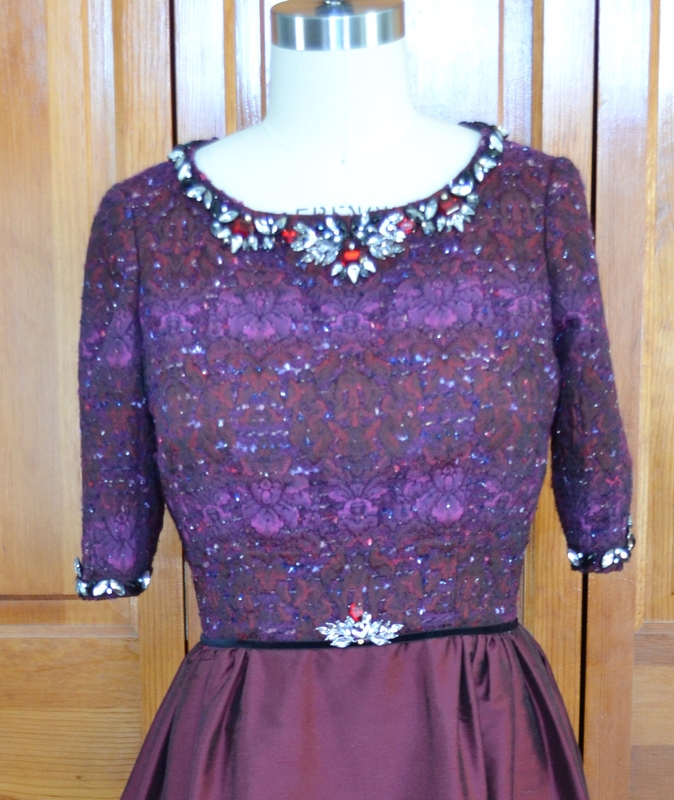 The waist and sleeve had to have a touch of embellishment too. It was a bit of a rush that night, getting ready and off to the event. The only photos were a few cell phone shots. This is a business event for my husband, I just tag along because it raises money for local children’s charities and I love to dress up. They always say “the cars are the stars,” at this event but it’s also lot of fun seeing so many people so dressed up, the place was packed and the people watching was just amazing. No one knew my secrets, but we can share. I love to hear yours. Thank you, my vision is getting much better and I’m sewing much more. The RTW Fast changed my thinking, except for buying a sweater and a couple of t-shirts, I still prefer to sew everything. Thank you, looking back I realize it was therapy. It got me up and about and thinking creatively again. It’s gorgeous, Denise! 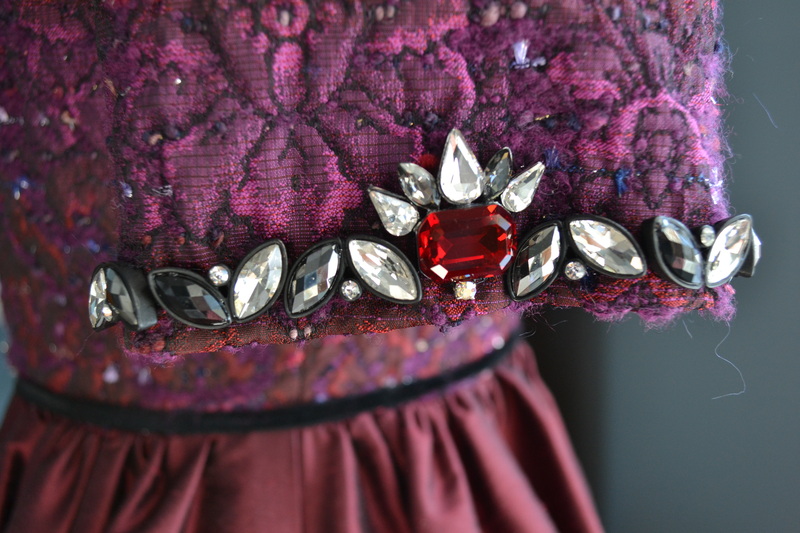 I love the embellishments – restrained, but notable. Hope you had as much fun as this dress warranted. Thanks, the evening really was fun. Detroit gets so much negative press, but this is a night it just glitters. Stunning dress and there is nothing wrong with using what works as there is no way any of those attending the night would have guessed. Thanks, it was nice to work with such lovely and forgiving fabrics. Just beautiful Denise I love the colours. Lovely work. 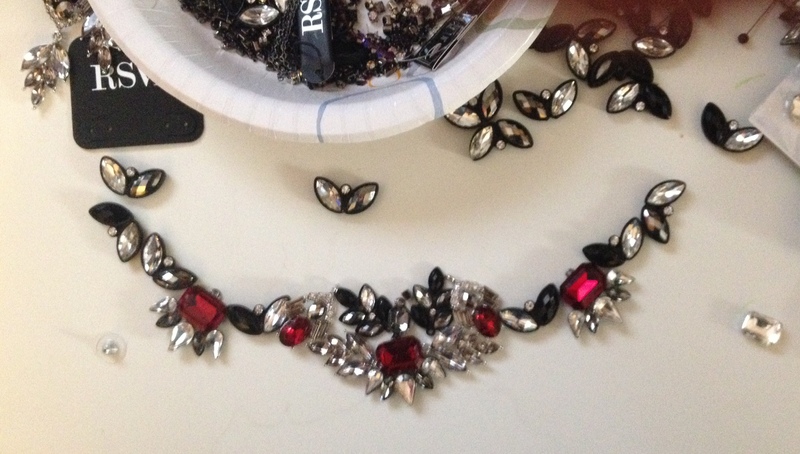 I love your idea of deconstructing jewelery to use as trim. It looks fabulous. Your next post asks for a password to be able to read? Oh, sorry. 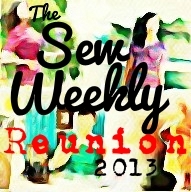 It was a post I did for the Blogging 101 course on wordpress, not really I sewing post. I thought it would be hidden,guess I was wrong. Thanks for the kind comments and the laugh. I’ll remember that as a rule of thumb. I am speechless!! It is just beautiful! How do you get the embellisments not to pull the neck down? Whenever I try to do something like that, it pulls all the neck. Any tips!?! I would love to meet up with you and see your wardrobe…we have such similar taste! Thank you, the neck did pull down a little. 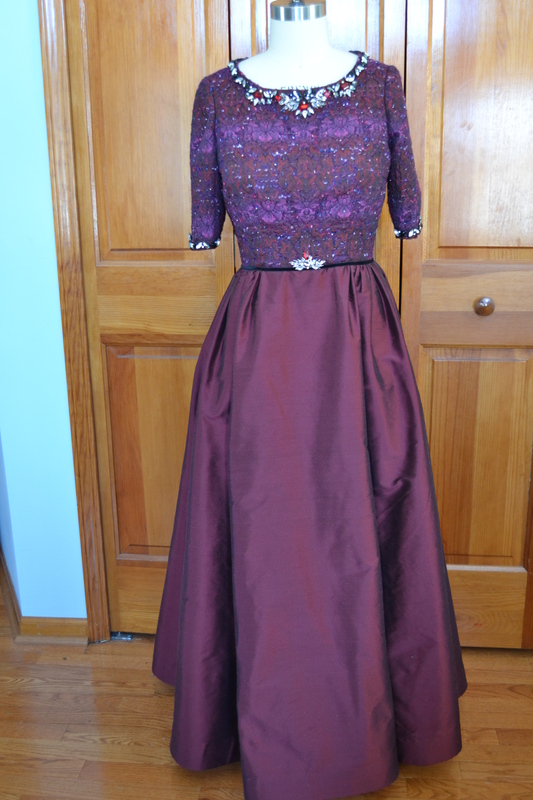 It doesn’t show on the dress form, which has much better posture that I do.It did sag a little below the embellishments and I am considering adding some stiffer interfacing between the underling and lining. Since I love all your makes, I would say we do have very similar taste. I would love to travel to England. While cleaning a closet this week I came across a pair of crochet gloves I bought at a little shop in Covent Garden many years ago, so lovely. sigh.